The Acropolis ruin sitting prominently on a mountain in the centre of Athens is one of the most recognisable monuments in the world, and one you identify immediately with Greece. Why not escape to the Mediterranean and see why visitors simply fall in love with the country. Everybody has a different view of winter when it sets in. 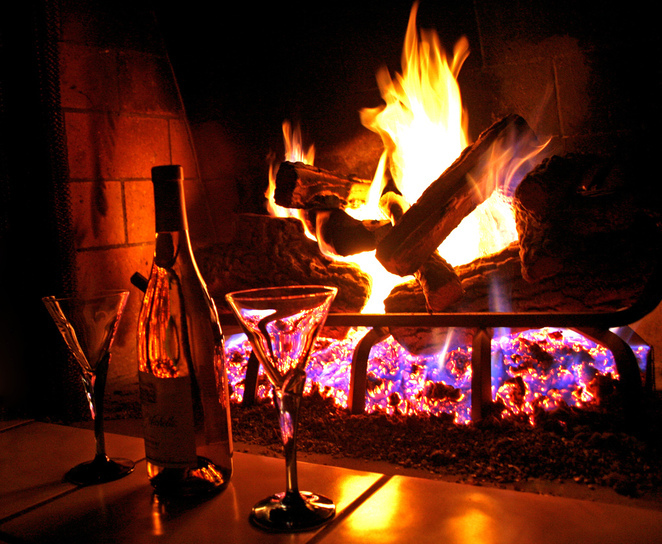 It's a great time to enjoy the time indoors by a roaring fire sipping various blends of red wine, or heading to the nearest snowfield. Others become experts in the kitchen, sharing their latest slow cooker recipes and tasty winter soups. For some, winter can bring on the blues and low energy levels. I admit, I hibernate like a bear during winter. I have not one inch of fashion flair to simply piece together a winter wardrobe, and feel I need a college degree just to coordinate a fashionable trendy look to step out. 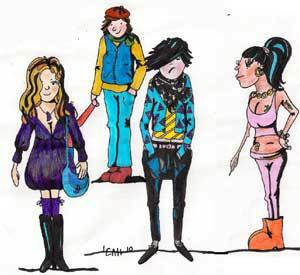 Give me maxi dresses, bikinis and strappy shoes over scarves, boots and coats any day. When I can, I like to escape towards the Mediterranean sun. Destination? The City of Athens and the island of Santorini in Greece. It's like a craving, a longing and eagerness to return every summer. I hope I can persuade you to fall in love with this beautiful country as much as I have. Before heading off to the island of Santorini I suggest a day or two in Athens to immerse yourself in the rich Greek culture and history of this incredible city. On my first visit to Athens I was literally mesmerised the minute my eyes first caught a glimpse of the ancient historic ruins still standing tall in the city centre. Walking around the city felt as if I could sense the spirits of Gods from Greek mythology on every street corner. A flashback to my history class where I first saw these images in text books, were now a reality. 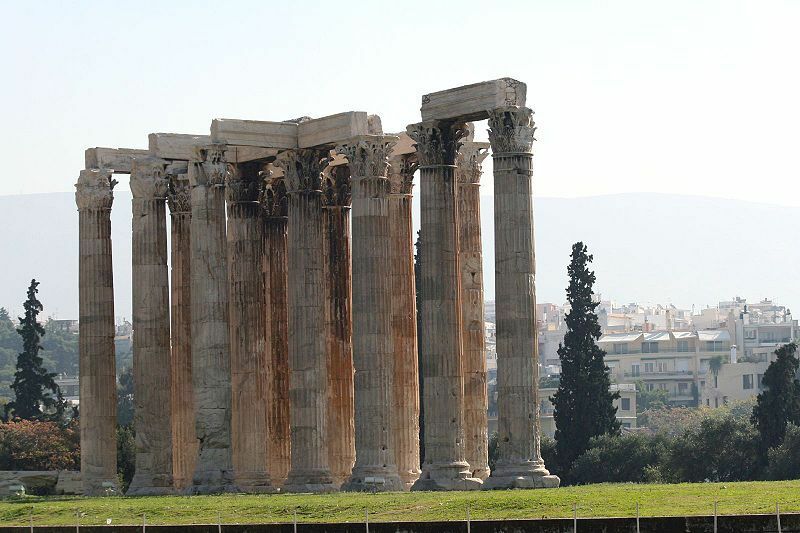 Read the history of the Temple of Olympian Zeus here. The history of this city is clearly evident - neoclassical buildings draped in solid gold fixtures and statues, to the traditional changing of the guard at Greek Parliament House depicting the pride Greeks clearly hold for their country. The most important civilisation of the ancient world, the buildings around Athens are snapshots of this history. Plaka is best known as the "Neighbourhood of Gods," the oldest neighbourhood in Athens that has retained its original buildings and charm. It's cluttered with fancy restaurants, bars, unique shops where you can buy Greek pottery, and visit archaeological sites close by. Mansions are well preserved, and others that had deteriorated over time had me thinking just how many generations of families had once occupied them. 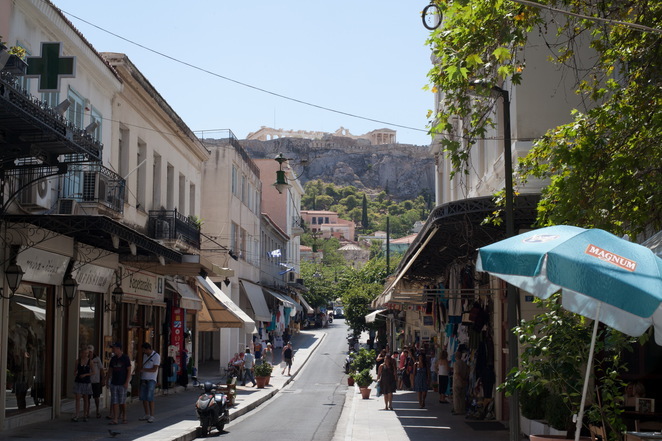 Monastiraki in the centre of Athens has a delightful flea market where you can browse for hours, you may find an old piece of jewellery, rare book or many collectable antiques. Kolonaki is a little more upmarket and modern, where I was picking up some stylish fashion tips from the locals walking by. Everything has its place in this city. I prefer to do my shopping in the huge department stores in Athens like Attica and the many boutiques that stock quality pieces from local and European designers. 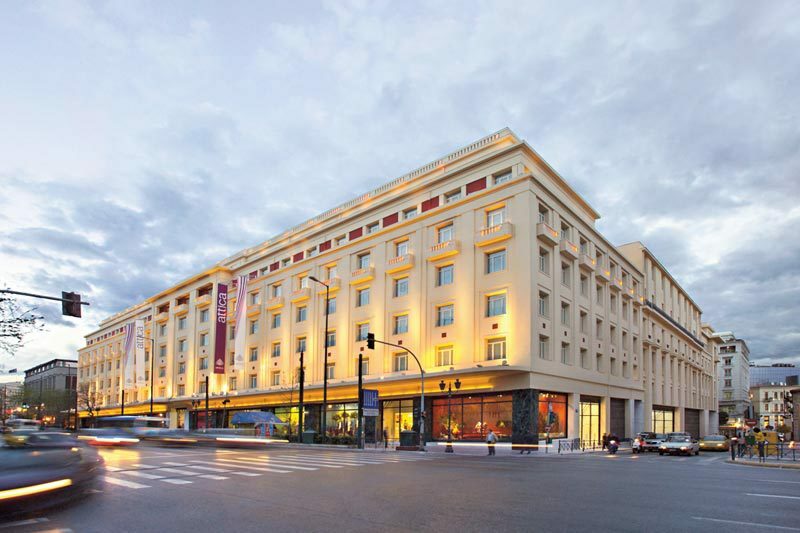 Attica is the largest and most luxurious department store with 360 shops and 860 different brand names. Did I mention the shoes? I never had a shoe fetish until I visited Athens. I felt like I was a kid in a lolly shop when I walked into shoe shops. On my first trip I bought 20kgs of shoes home with me. 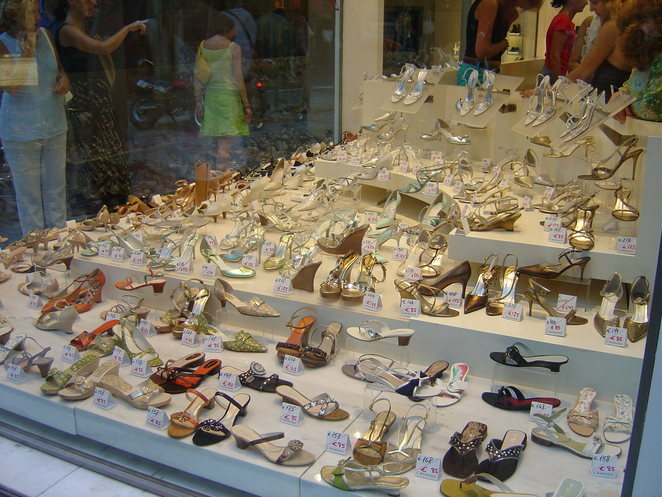 "Shoe heaven". This is how my shoe fetish started. A window reeled me in! Even the newspaper in Australia caught onto my love of shoes and Athens. The Acropolis Museum is a must see, and I cannot stress how unbelievable this museum is. Celebrating its fourth year in 2013, it showcases archaeological finds and sculptures that once decorated the Acropolis of Athens. 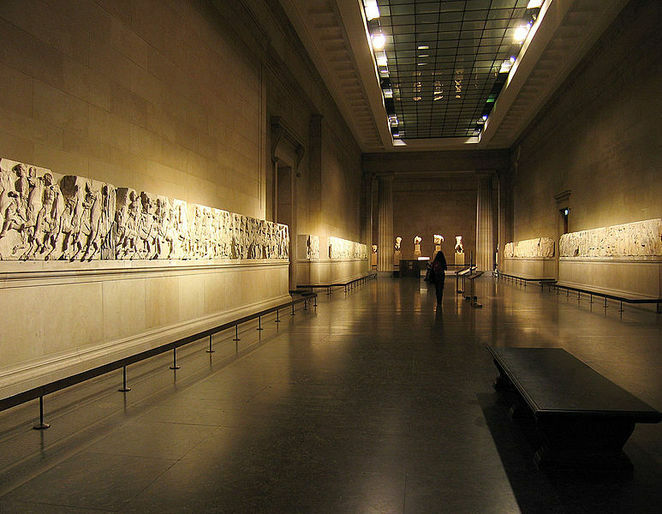 I had a feeling of sadness come over me to see missing pieces, (replicas are made out of white plaster) namely the Elgin Marbles not on display, but rather in the hands of The British Museum of London. These were taken over 200 years ago by Thomas Bruce, the 7th Earl of Elgin while serving as the British Ambassador. It stirred up emotions as I felt the pain my Greek ancestors went through fighting for their country, and today, the country is still fighting unsuccessfully to retrieve the pieces back to compliment the collection. 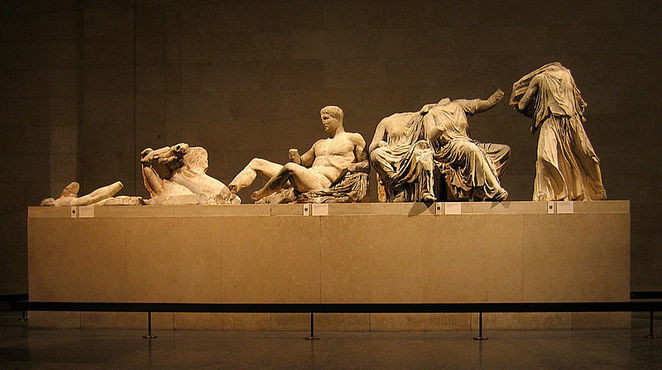 The debate still continues today whether they should stay in Britain or be returned to Greece. In the museum, I watched a captivating re-enactment presentation on the history of the Acropolis. It also showed how archaeologists retrieved the pieces, and the process taken to get them on display - absolutely riveting. View outside the museum window (how clean is this window)? After browsing for a few hours through the museum, I took a coffee break on the delightful outdoor deck, with striking views out to the Acropolis. Judging by the conversations I was overhearing at nearby tables, the atmosphere was truly cosmopolitan. A visit to Athens is not complete until you visit the famous landmark sitting proudly on a hill above the city centre. 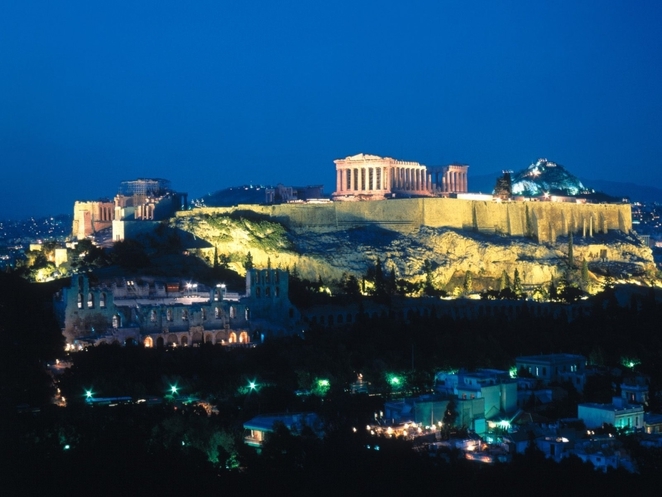 The Acropolis of Athens is one of the most monumental tourist sites. This is Greek history at its grandest, where you'll see ancient ruins best known as Propylaea, Temple of Athena Nike, the Erechtheion, and the most recognisable ruin The Parthenon. I'm sure Goddess Athena's spirit still lurks around the temple. Archaeologists are continually digging around the site, but to see it up close in its glory, was one of the most uplifting experiences I've ever felt. The Caryatids of the Erechtheion. One of the original six figures taken by Lord Elgin in the early 19th century, is in the British Museum in London. 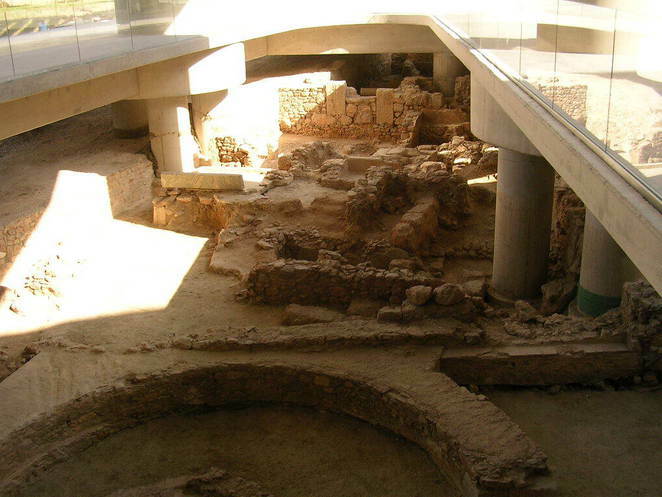 The Acropolis Museum holds the other five figures, which are replaced onsite by replicas. 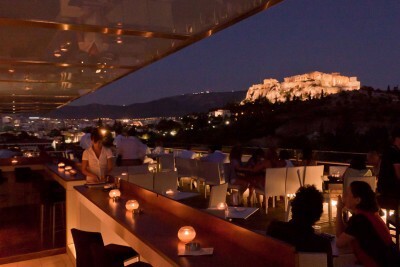 The atmosphere around dinner time near the Acropolis site is electric. 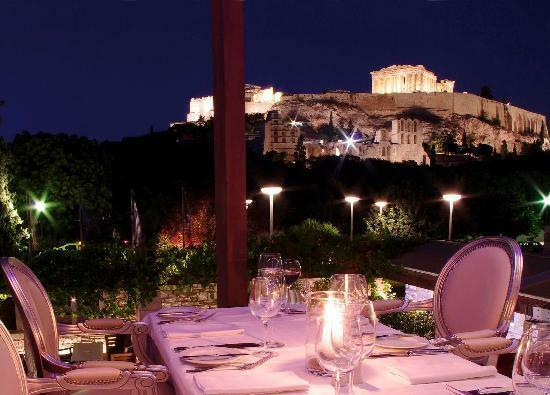 On this warm summer night, I found myself dining at Dionysos Restaurant visited by many celebrities and dignitaries, which boasts the most stunning view of the famous landmark. As I sipped on a glass of wine waiting for my 'mousaka', I was absolutely fixated on this battered ruin, flood lit at night, giving off an earthly spiritual glow. Over dinner as the sun was setting, masses started to fill restaurants, cafes, bars, and the ancient open air theatre. There's a vibrancy I felt among the people, definitely enchanted and embracing the history surrounding this city. 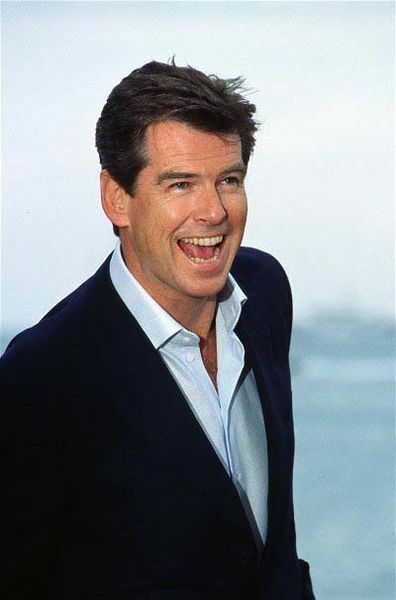 Pierce Brosnan and director Chris Columbus dined at Dionysos Restaurant in January 2010. 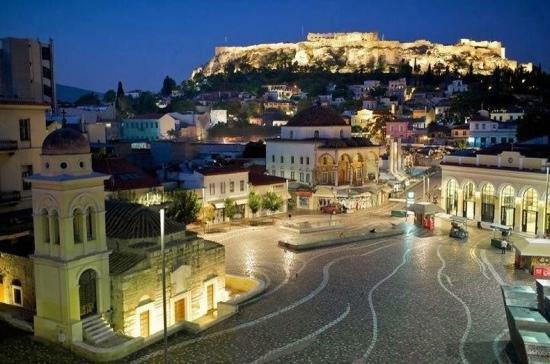 They visited Greece to present the world premiere of the movie "Percy Jackson and the Olympians: The Lightning Thief." Greece is a popular holiday destination for Hollywood stars. Many have bought or are looking to buy homes. Tom Hanks and his wife Rita Wilson own a six-acre summer house on the small island of Antiparos for the family to enjoy a quiet and natural escape. 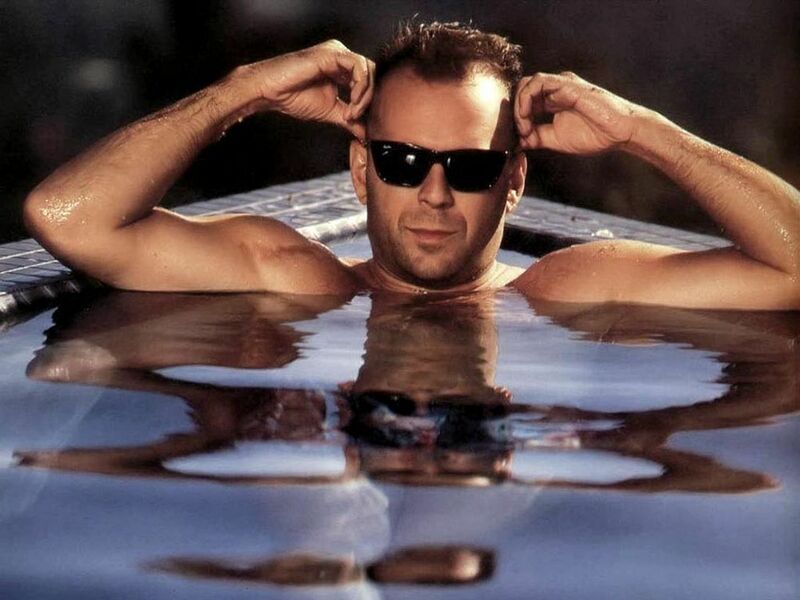 Sean Connery owns a home at Porto Cheli near the island of Hydra and Spetses, and Bruce Willis is rumoured to have bought land on the island of Corfu. Madonna is said to have an interest in purchasing a luxury villa on the island of Ithaca where she frequently visits. The villa is part of a glamorous resort complex that is currently in the works on the island by Greek-Australian entrepreneurs. The name of the resort will be "Odyssey 6* Resort" and will be built southeast of the island offering breathtaking views of the sea and the coast. In July 2013 while on holiday in Greece, Madonna asked for the walls in her residence to be painted her favourite colour white, with white flowers in every room and white carpets. Nicole Kidman and Sarah Jessica Parker are looking to buy holiday homes to escape to on their breaks. Julia Roberts and Richard Gere often visit Greece, as they enjoy meditating on the island of Patmos. Richard Gere has been visiting the island for 17 years and is also looking to buy his slice of heaven. The Greek islands of Santorini and Mykonos also attract Hollywood stars, celebrities, and the rich and famous from all over the world including Sofia Vergara, Leonardo Di Caprio, John Travolta, Kelly Preston, Demi Moore, Harrison Ford, Shakira, Lady Gaga, Michael Jordan, Steven Spielberg, Melanie Griffith, Hugh Jackman, Michael Douglas, Catherine Zeta-Jones, Liz Hurley, George Michael, Russell Crowe, and Johnny Depp. 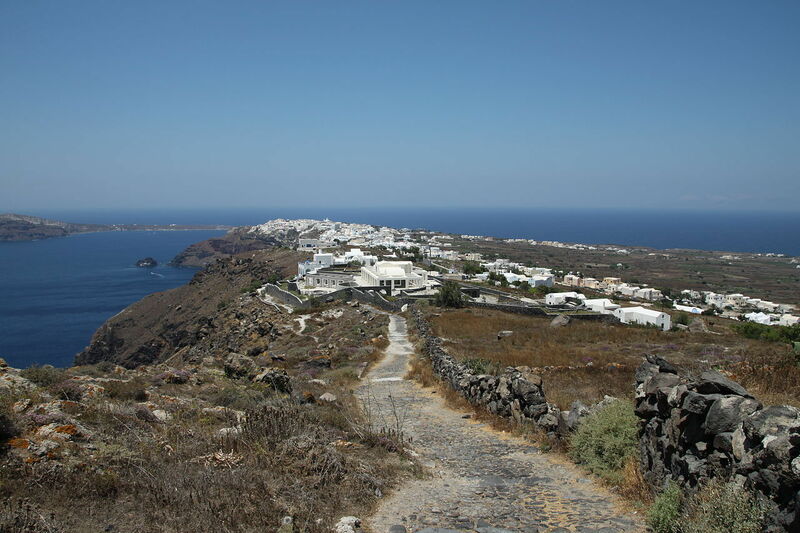 Brad Pitt and Angelina Jolie bought a villa in Santorini, where Jolie shot scenes for the movie Tomb Raider, after being enchanted by the island's beauty. As it was getting late, it was time to call it a night to head to Santorini the following morning. After dinner I took a final stroll around the cobblestone streets at the base of the Acropolis. While admiring the historic buildings, bars and cafes packed with people, I spotted the newly renovated Thissio View Restaurant. With its inviting rooftop area and an awe-inspiring Acropolis view, I ordered a coffee and devoured a 'kataifi,' (a Greek dessert), within a minute. 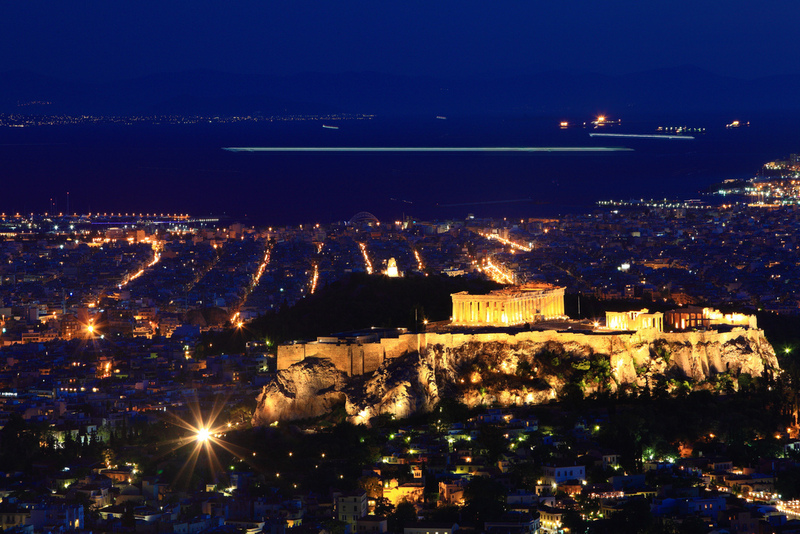 A brisk walk back to the hotel was the perfect nightcap, Athens by night is purely enchanting. Athens has been labelled a 'concrete jungle' but it's far from that. Even though the country is in crisis, it's still rich in culture and history. Marble is a dominant feature in and around many buildings, and since the Athens Olympics in 2004 the city underwent an unbelievable transformation, including a new airport and subway system. I've never seen such incredible bathrooms in hotels, resorts, cafes, restaurants, bars and clubs. The style and designs are top class, and are reminiscent of what I believe you would see in the homes of the rich and famous. There's so much more to do and see in Athens, and I've only highlighted what you can see in one or two days before heading off to the island of Santorini. Click here to read about one of the most popular island in Greece - Santorini, and the stars and celebrities who have holidayed there. I felt the same way about Athens as you did on your first arrival. Spelbound and feeling close to the Gods. I had read about Greece in many books before my departure. I was so inspired that when I arrived home I went to University and studied Modern Greek and Classical Greek for four years. I also completed my Masters on a Greek topic. I am still totally in love with the place. No man has ever been able to replace Greece in my heart. If any readers ever get there, you absolutely MUST go to Pella and from there investigate Philip II (father of Alexander the Great) tomb at Vergina. It is unforgettable in the true sense of the word. Just go!